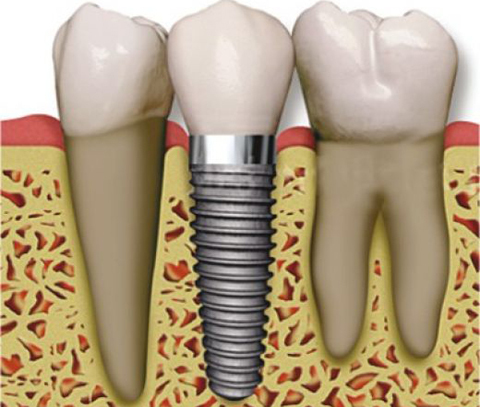 A dental implant is the most effective way of replacing a missing tooth. It has the same structure as a natural tooth. A titanium root form is surgically implanted in your jawbone. After the jawbone heals, a replacement tooth, or crown, is attached to the top of the root form. Individual implants can be used to replace some or all of your missing teeth, or several implants can be used to secure dentures. Implants are a permanent solution to missing teeth. The presence of the root form prevents jawbone shrinkage and facial collapse that result when all of your teeth are missing. If only some of your teeth are missing, the root form will prevent the remaining teeth from shifting. Your teeth with implants will look, feel, and function like natural teeth. When you smile, people will think that they are seeing your beautiful natural teeth. Your implant surgery will be performed by an experienced surgeon who will review your medical history, perform diagnostic studies, determine if bone grafting is need to support your implants, and use quality implant fixtures—all to ensure your implants are properly placed. When your jawbone heals, Dr. Miranda Lacy will use her experience in cosmetic dentistry to give you natural-looking crowns, which will be secured to the root forms to complete your beautiful new smile. Contact our office for an appointment to find out if you are a candidate for dental implants.